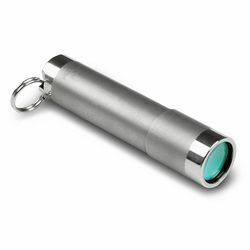 This extra-compact stainless steel flashlight uses just one AAA battery and can produce a cone of light of up to 25 lumens. With a magnet integrated into the flat end, you can use it on the underside of a cabinet or metal shelf for hands-free convenience. Includes AAA battery, spare "O" ring and split-ring for key chain attachment. Please note: Do not use lithium-ion batteries in the Preon P0 as doing so will destroy the light.